We are still a little new to the Instagram community, but slowly catching on. Instagram has created some many faucets of smaller communities, whether it be design or fashion, it really has created a creative outlet for so many people. Each community is inspiring in so many ways, especially when it comes to bloggers and other interior designers. I feel like everyone is someone else's cheerleader, which is amazing. There is a lot of support and positivity in a not so positive world, that makes me feel like I am part of a family. I have a friend that has a great Instagram account, Dear Owen Co. I have known her for years, her husband and my husband were part of the same fraternity in college. Fast forward some years later when she was pregnant with her son, she designed an amazing nursery. His nursery became a hit over night, and I swear everyone was re-pinning it. This was about the time I was started to get really into design blogs. I followed along her blog and many others for my daily inspiration. She contacted me a couple of weeks ago to join in on her #takeovertuesday on her instagram account. Ivy House was honored to be part of it! Her theme was kids rooms or nurseries. Kellie and I are in the midst of putting together our boys' big boy rooms, because the twins and Harrison decided to be rambunctious two year olds and start climbing out of their cribs around the same time. I am also continuously tweaking my older son Jameson's room, so his room was out. Then I remembered, we did an nursery for a baby girl several months ago. Kellie was in the process of a total remodel of their home, when the clients found out they were pregnant. This worked out great, since Kellie then got to customize the design of the room during the remodel process. Side Note: Our client, Emmalee got pregnant while in her third year of law school, had her baby before finals, and is now taking the bar with an almost three month old...and you think you had it rough the first couple months of having your first baby ;). Let's all wish her luck, as she is taking the bar this week! Our clients wanted a serene forest theme for their baby girl's room. Soft colors with touches of pink created the palette for the room. 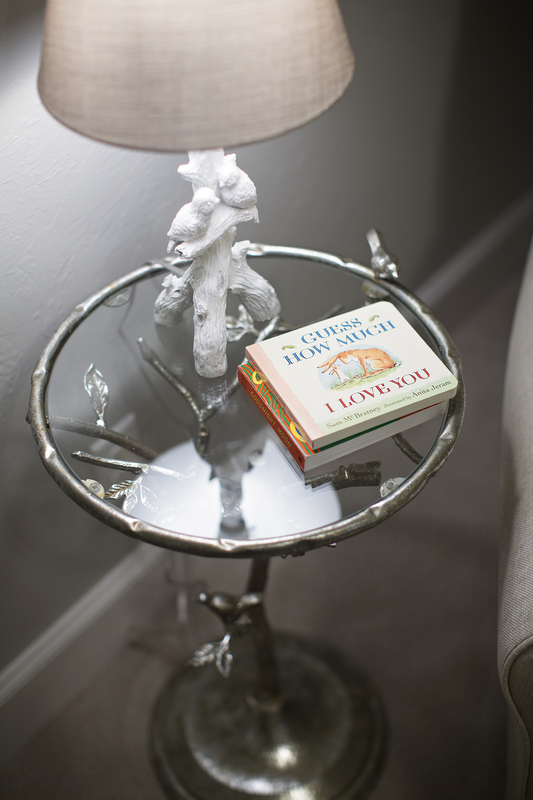 A gorgeous silver accent table with branches for legs created a great touch next to the nursery chair. The custom closet creates a more organized space for little one's clothes, blankets and all those baby accessories. The prints above the changing table create a focal point for the room, along with the gorgeous restoration hardware crib. The roman shades are black out, and topped with sheer curtains for a more serene touch. Both the changing table and crib are from Restoration Hardware. I love the clean lines on both pieces, and as always, RH always has an elegant touch.